Dolerites of olivine basaltic composition occur in the northern gneiss area of Sunnmøre (also farther N and NE). Two main types are found; both rich in plagioclase, namely subophitic olivine dolerites, fine to medium grained, occasionally with (optically anomalous) hypersthene and subdoleritic, olivine-free dolerites, medium to coarse grained, usually carrying- small amounts of (optically normal) hypersthene. The shape of the dolerite is invariably that of a symmetrical laccolith, concordantly enveloped by gneiss. Although a few minor, transgressive structures are found, neither crosscutting feeding channels nor stoped block s of the wallrock are observed. Chemically, the dolerites are characterized by high Al, relatively low Ca, and very low H20. Of the trace elements, V is abundant, while Cr is practically absent. After consolidation, large-scaled reactions between the pyrogenic minerals took place, and a .series of secondary minerals were formed: bronzite, diopside, garnet, biotite, amphibole, etc., initially in a peculiar corona pattern. The final products of metamorphism are eclogite-like, amphibolitic rocks with crystalloblastic texture. The primary and secondary stages of the genetic history of the dolerites are discussed. A comparison with other dolerite provinces discloses a rather close similarity with the hyperites of SE Norway and SW Sweden. 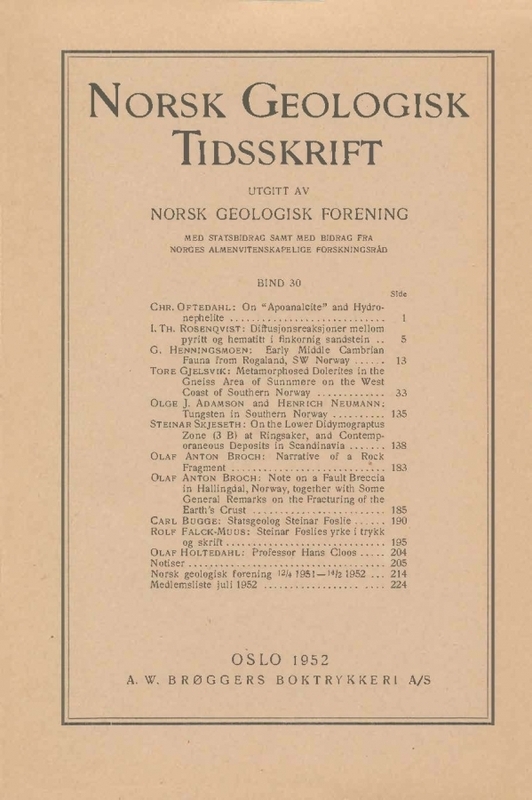 Finally, the age problem of the intrusion is considered, and the consanguinity of the Sunnmøre dolerites and eclogites is shortly discussed. A summary of the petrological discussions is presented on pp. 125-131.